Fruit fly covered with capture threads of the feather-legged lace weaver (Uloborus plumipes).HANA ADAMOVAThe woolly webs of orb-weaver spiders form an inescapable trap around prey. 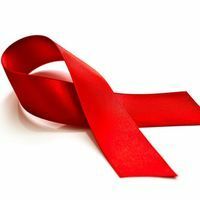 But it’s not just the threads’ tangles that ensnare meals. As researchers reported this week (May 31) in Proceedings of the Royal Society B, the waxy coating on some insects teams up with fibers from the spider web to form a composite adhesive material, gluing prey in place. Thus, in a rather dark turn of events, the insect’s cuticle promotes its own capture. Orb-weaver spiders produce fine threads made of nanofibers, arranged like beads on a string with puffs and intermediate zones. The spiders have an organ called a cribellum, which pushes out silk strands, and rows of leg bristles that comb out the silk to produce a woolly texture. Kukulcania hibernalisFLICKR, MARSHAL HEDINUnlike other types of spiders that produce viscous silk, orb-weavers were not known to make any type of glue, yet prey appeared to get stuck in their webs for longer than in viscid webs. According to the study, scientists had supposed that intermolecular forces, such as van der Waal’s forces that help geckos walk on walls, were at play. But, these forces could not explain the efficacy with which orb-weaver webs ensnared prey. There was also another puzzling quality of the web. Orb-weaver silk would never stick to artificial surfaces. However, Opell demonstrated more than 20 years ago that on the glassy, perfectly smooth elytra of a lady beetle, cribellate silk strands were shown to generate the highest adhesive force yet determined. 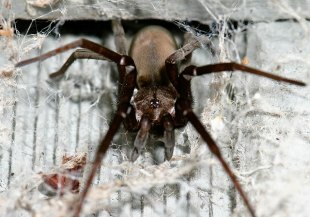 To explain the mystery behind an orb-weaver’s death trap, Anna-Christin Joel, a postdoc at RWTH Aachen University in Germany, and colleagues raised two species of orb-weaver spiders, Uloborus plumipes and Kukulcania hibernalis, in the lab, let them weave their silken traps, offered up a variety of insects, and watched what happens. Live insects did not have a chance among the woolly silk. Less than 10 percent of fruit flies could escape, and death was quick—within five minutes. In the wild, spiders capture prey within seconds; a retention time of minutes allows even very slow spiders to get their meal. In another experiment, the researchers froze 19 different species of insects, separated the elytra (hardened forewings like those in a ladybug) and wings, covered them in cribellate threads, and examined them under light microscope. 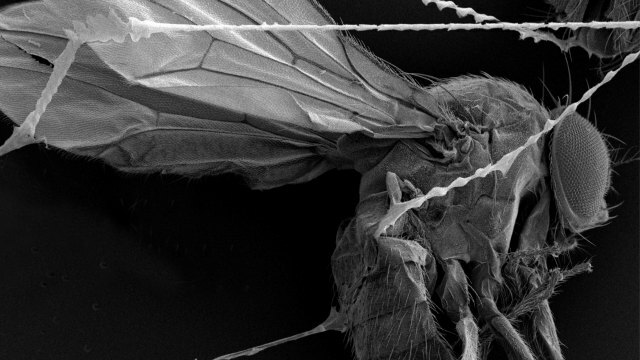 When U. plumipes threads touched the fruit fly, something unexpected happened: certain parts of the attachment area between the fiber and the insect seemed to have fused into one layer. 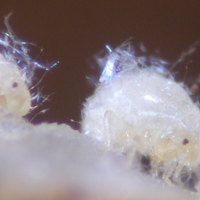 “The first time I saw the nanofibres embedded in the insects cuticle, I thought my student messed up with the [scanning electron microscopy] sample,” says Joel in an email. Yet similar fused matrices were observed in combinations of three orb-weaver spiders and 19 insects. 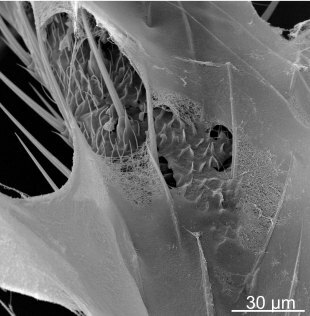 Cribellate capture thread adhered to the leg of a fruit fly. Regions where the fibres are embedded in the waxy cuticle of the prey are visible.HANA ADAMOVAThe researchers performed further experiments with the cowpea weevil (Callosobruchus maculatus) and capture threads of U. plumipes, which seemed to have maximum fusion of the web and elytra among the insect-web combinations tested. “We could observe live that the thread is sucking in something from the cuticle by only using the light microscope,” says Joel. The researchers watched “a steady migration of a front of ‘fusing’ fibres,” according to the paper. Given enough time, the fusing fibers extended along the entire capture thread. Under a transmission electron microscope, the researchers observed individual nanofibers from the spider web, which seemed to be embedded in a fluid matrix. The nanofibers had the same chemical composition as the cuticle of C. maculatus. When the cuticle was removed from the elytra using a solvent, there was no formation of a fused matrix after it was exposed to the spider’s thread. 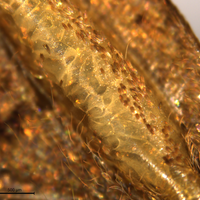 Moreover, a metal surface coated with cuticular wax elicited the same response as the insect elytra. R.A. Bott et al., “Adhesion enhancement of cribellate capture threads by epicuticular waxes of the insect prey sheds new light on spider web evolution,” Proc Royal Soc B, doi:10.1098/rspb.2017.0363, 2017.